The mysterious murders of Cheng Li’s father and fiancee at the hands of notorious clan Cold Moon and the 12 Stars causes our heroine to seek out some of the best swordsmen in town to exact her revenge. The catch being that the determined Cold Moon has never shown his face. His cover is almost blown when those in-the-know get about as far as saying, “Cold Moon is…” before they are mysteriously executed. 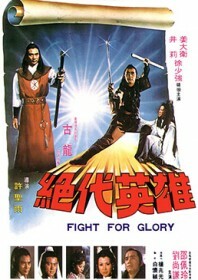 Pondering dramatics slow down this run-of-the-mill costume drama which is otherwise full of sword fighting and extended slow-motion death scenes, but nothing original. Studio: San Sun Film Co.